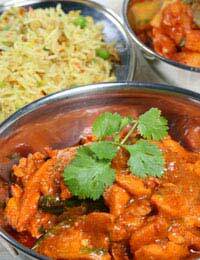 The most common misconception about Indian food is that it is all about curry. The truth is that what is referred to as Indian food actually covers a huge range of regional cuisines. Differences in climate, landscape and religious requirements have produced cuisines of such diversity that it is somewhat misleading to lump them all together under the heading of Indian food. Indian food available in the UK tends to be adapted for Western tastes, which roughly translates as less spice and more fats, but in its original context it is more likely to be lean and healthy. The creamy yellow korma often served in Indian restaurants in the UK is utterly unlike the same dish as served in its authentic form which would have a sauce more like rich, spicy gravy. The simplest way to categorise regional Indian cuisines is to group them according to geography. There is considerable overlap so the following should be seen only as a rough guide. Thick, richly flavoured sauces that are usually no more than moderately spiced are the hallmarks of most Northern Indian cuisines. Hot summers mean a bountiful harvest of fresh vegetables and fruit – much of which is dried and used in fragrant, aromatic dishes during the region’s bitterly cold winters. Some of the most popular delicacies originating from the area include samosas, chicken tikka and biryani. In general, dishes are served with breads such as naan or the stuffed paratha rather than rice. The humid coastal climate of Southern India has produced probably the fieriest dishes of all Indian cuisines. Mountains of rice are often served alongside any dish and lentils usually feature heavily. One of the specialities of the area is pancakes made with rice and lentil flour called dosas. The classic lentil daal is another staple recipe which can be made in a myriad of ways. The spicy soup called sambaar is one of the most popular variations. The defining characteristic of this region’s food is its simplicity. Unlike the rich, full-bodied dishes of the North or the fiercely hot food of the South, Eastern Indian food tends to consist of lots of green vegetables, often steamed to preserve their freshness. This area is famous for its sweets and makes great use of dairy products which are less common in other Indian cuisines. This region has more diverse styles of cooking than any of the others due to its relative proximity to the Middle East. The food is mostly vegetarian and very often includes peanut and coconut. Gujarati cuisine is sweeter than is typical of India in general and the former Portuguese colony of Goa, source of the vindaloo, has absorbed many European influences. Ghee is clarified butter and is used in place of oil as it has a higher smoke point and a longer shelf life. The product marketed as curry powder in the West is really just a variant of a traditional Indian spice blend called garam masala. This can be mixed in many different ways according to the requirements of the dish. When it comes to cooking curry, most Indian cuisines place great importance on the sequence in which foods should be added to the hot pan. First of all, garam masala and any other dry spices being used should be lightly fried in ghee to encourage them to release their full flavour. Once they have filled the kitchen with their mouth-watering aroma the curry leaves that are an essential seasoning for all authentic curries should be added. Next, another layer of spices is introduced, often including garlic, ginger and chilli, and any vegetables can be added. The possibilities here depend only on the cook’s imagination and the availability of produce although browning some onions in the richly spiced ghee gives a deliciously sweet base on which to build. When the vegetables have begun to cook, nuts and dried fruit might be added and coconut milk to form the base of the sauce.Finally, in accordance with the Indian culinary tradition that each of the six types of flavour should be present in each dish, some kind of sour ingredient will often be added. This could be tamarind, yoghurt or lime.